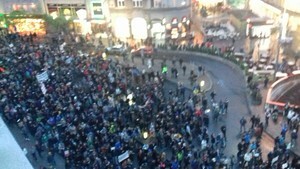 Around thousand people gathered in protest in Belgrade. The rally brought together both liberal activists, right-wing groups, citizens, students and supporters of Serbian opposition. Anti-government protests are being held across Serbia, including cities of Belgrade, Nis, Novi Sad, Kraljevo, Kragujevac and Novi Pazar. 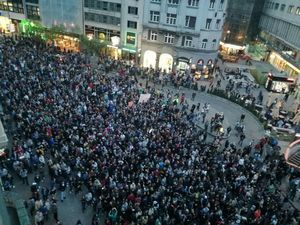 Across Serbia people are protesting against election regularities and “dictatorship” of Serbian Prime Minister Aleksandar Vucic. 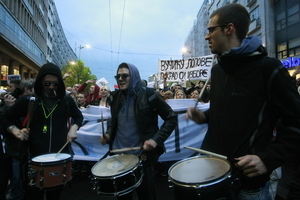 The protests in Belgrade now gained about several thousands participants. The demonstrators are now walking from Serbian parliament building towards central Belgrade’s square, Trg Republike. More then 500 people gathered in anti-government protests in Serbian northern town of Subotica. According to news agency Beta, around 5,000 gathered in Serbian southern city of Nis protesting against Serbia's presidential election winner Aleksandar Vucic. The protesters, mainly students, said they do not accept Vucic as a president. 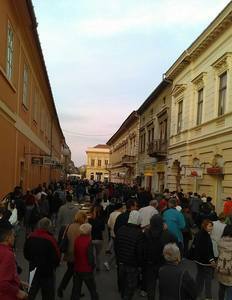 Several hundred people also joined anti-government protests in Serbian towns of Zrenjanin and Sombor. Over 200 people, mostly students, rallied against Aleksandar Vucic in the southern Serbian town of Kraljevo, Beta news agency reports. 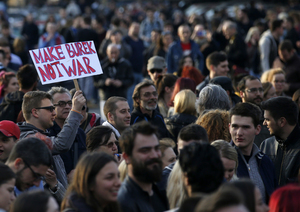 The protest began in front of the local branch of Serbia's ruling Progressive Party. The event ended without incident. Several thousand protesters in Belgrade are heading towards the Government building, blocking traffic and chanting anti-government slogans. The number of people has been increasing since the protest began at 6pm. 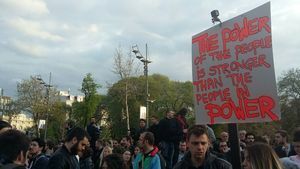 Aleksandar Balan from Belgrade told BIRN he came out to protest the „obvious election theft that made voting useless“. „There are almost seven milion people registered to vote and Serbia's population is something over six million. Everybody knows who gets the votes of the non existing people,“ said Balan, who is unemployed. 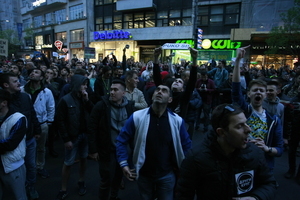 Several thousand protesters in Novi Sad walked to the building of provincial public service RTV, shouting “Go out, go out!” and urging the TV to report about the protests against Serbian Prime Minister Aleksandar Vucic. Last year, Serbian journalists have complained of a politically inspired purge of editorial staff in Radio Television Vojvodina, RTV, the public TV station in the Serbia's northern province. 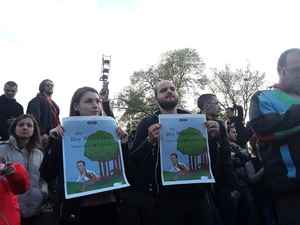 Protesters say the sackings are a direct result of political pressure being applied by the Serbian Progressive Party, which now runs Vojvodina. Anti-government rally in Belgrade is coming to closure, after protesters lit torches in front of the government building, then placed an inflatable doll at the entrance and pelted the building with eggs. 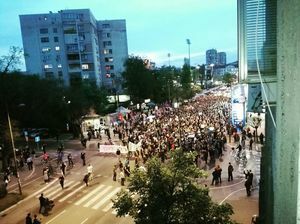 Protesters in Belgrade are still on the streets, walking back towards the parliament building where the protest started. Anti-government rally in Belgrade has ended with protesters shouting "Serbia Stood Up, See You Tomorrow". Macedonia's politicians who continue to block the formation of a new government are risking a radical shift in Brussels’ and Washington’s attitude and increasing the risk of sanctions being imposed against them. Read more. Thousands of people protested in towns across Serbia against what they call the “dictatorship” of Aleksandar Vucic, the president-elect and current prime minister. Read more. Bosnian lawmakers are to discuss an increase in excise taxes required by the International Monetary Fund to ensure a loan payment, but strongly opposed by the country’s farmers. Read more. 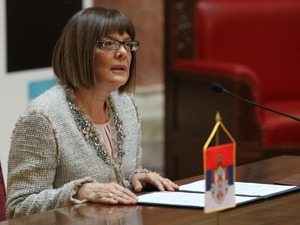 Serbia is expected to have a new prime minister at the beginning of June after the current post-holder, Aleksandar Vucic, was elected as president on Sunday, the National Assembly President Maja Gojkovic told media on Wednesday. "It [the new PM] will be someone who supports reforms in Serbia," Gojkovic said when making the announcement. She also stated that the Serbian Parliament will soon go back to its normal frame of work after it stopped for the election campaign. The accounts of Croatian coffee, tea and snacks company Franck as well as distributing company AWT International - major suppliers for ailing private Croatian company Agrokor – have been blocked from Wednesday because banks have activated promissory notes issued by Agrokor to its suppliers. Reporters Without Borders condemned on Tuesday "a campaign of lawsuits and verbal attacks" by Croatian nationalist groups against weekly Novosti, the newspaper of Croatia’s Serb minority. However, Reporters Without Borders claims that the articles "pose no threat to the Croatian nation", while the campaign to silence Croatian journalists "endangers democracy in Croatia". Bosnia's House of Representatives rejected a new law on excise tax on Wednesday, which was proposed by the state government and was the key remaining condition for the country's IMF program to remain on track. This rejection, caused by growing political quarrels within and between Bosniak, Croat and Serb ethno-political blocs, will almost certainly bring the suspension of Bosnia's IMF program, which could in turn risk the country's liquidity. Albania’s Sazan Island, on which a communist-era military base is situated, will finally open to tourists after the Minister of Defence, Mimi Kodheli, and the Minister of Economy and Tourism, Milva Ekonomi, signed an agreement on Wednesday to open it to the public. It is hoped that the island’s opening will help draw more tourists to the Albanian coast over summer. After Albania earned a record 1.5 billion euros from tourism in 2016, the country is trying to continue the upwards trend. 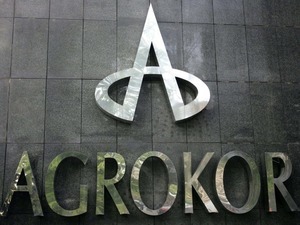 Credit-ranking agency Standard & Poor further lowered the credit rating of Croatia’s biggest private company Agrokor - currently going through a financial crisis - from 'B-/B' to 'CC' with negative prospects. The agency explained that the rating was lowered due to the standstill agreement signed between the company and its creditors on Sunday, according to which the debts are put "on-hold" but the company undergoes a restructuring process that would result in credit restructuring as well. The rating’s negative prospects announce the possibility that the Agrokor’s credit ranking could be lowered to 'CD' - selective bankruptcy. Around 1.000 people are attending the third protest against Aleksandar Vucic's government in Novi Sad. 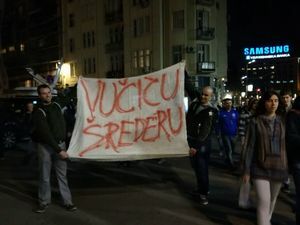 After an address from the Students' movement of Novi Sad, which organized the protest, the people started marching the main streets with banners. Several thousand protesters in Belgrade have started walking towards the offices of the pro-government tabloid Informer on Terazije square. They are chanting „Vucic, you are a thief“ and banging drums as they go. They will once again make a round of the city streets until they reach the seat of Serbia's Government, after which they will return to the National Assembly building. Belgrade anti-government protesters are taking a walk to the building of pro-government tabloid Informer, infamous for its defamatory and libelous reports about government critics. 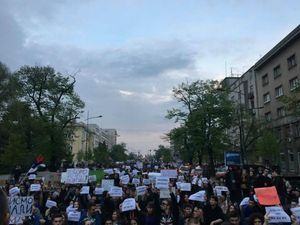 Around 2.000 protesters in the centre of Nis marched against Aleksandar Vucic's victory in the April 2 presidential election. 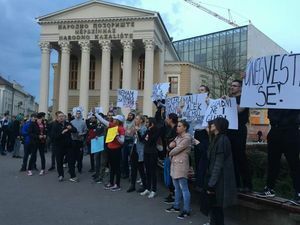 The protesting students expressed their support for the demands previously set by some of the students' organizations from Novi Sad and Belgrade – the dismissla of Parliament speaker Maja Gojkovic, management of the national broadcaster, the State Electoral Commission and the Regulatory Authority for Electronic Media. Thousands of protesters are now walking towards the building of Serbian public broadcaster, RTS. 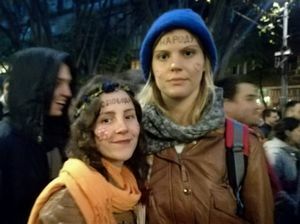 Serbian students today demanded removal of RTS management, among other things. 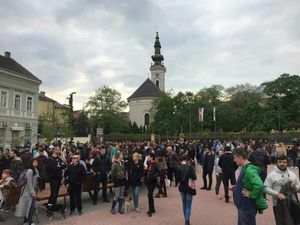 About 200 people gathered in central Serbian town of Kraljevo for a second day in a row to protest against the rule of Aleksandar Vucic, Serbian Prime Minister and President-elect. Jasna Zugic from Novi Sad, master of engineering project management, is coming to the protests because she considers the elections were unfair. “All you could see was Vucic campaigning, citizens without the internet could almost never hear about other candidates. Although many think that protests after elections are pointless, i think they are not, because we can always put pressure on government to respect the law, democracy, institutions and the voice of the people”, she told BIRN. Belgrade protesters blocked the traffic in front of the building of public broadcaster RTS, shouting “Thieves Out!”, “You Sold Out!” and "We want resignations!" The scheduled „Protest Against Dictatorship“ in the southern town of Novi Pazar did not take place because of the rain, Beta news agency reports. Only about a dozen young people showed up at city square, but they did not hang their banners or walk the city streets. They have not given up, however, and announced they would hold a protest tomorrow. At a previous rally against Aleksandar Vucic around 50 people in this small town showed up. College student Sasa Loncar said he and his friends came to the protest in Belgrade because they want things to change in Serbia. „I came here because of Aleksandar Vucic's tyranny, especially because other presidential candidates were blocked in the media,“ said Loncar. He said he and his friends voted in the presidential election because they are young and have to shape the country’s future. 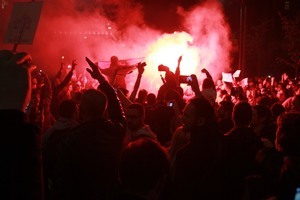 Anti-government protests in central town of Kragujevac are ending in front of the building of city's assembly.